Bananas are one of the most popular fruits around. In fact, they seem to be America’s favorite fruit, according to the USDA. The average American eats 27 pounds of bananas a year, and it’s no wonder! They’re high in potassium, dietary fiber, antioxidants, and vitamins B6 and C.
But what you may not know about bananas is that you don’t have to wait for them to turn yellow to enjoy them. In fact, there may be benefits of eating them green that you don’t get when they’re ripe. Both green and yellow bananas have their own perks, but people who have diabetes should lean toward the green ones. What are the benefits of green bananas for a person with diabetes? You may have noticed that bananas get sweeter as they ripen. This is because the bananas’ chemical composition changes through the ripening process, turning from starch to sugar. 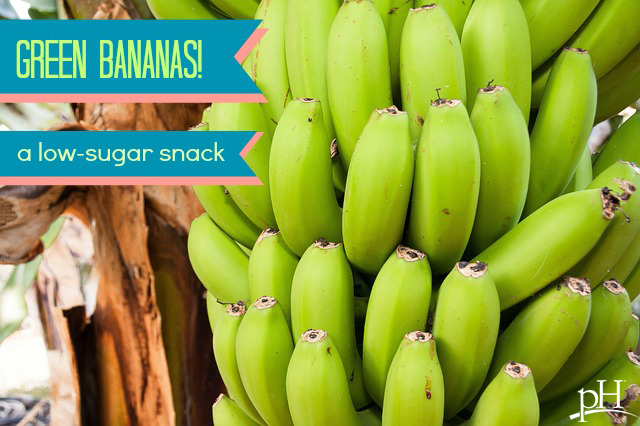 This means the green, unripe bananas have much less sugar than the fully ripe bananas. Resistant starch has also shown promise for being a natural weight loss tool. However, if you’re like the average American, you probably don’t get nearly enough resistant starch in your diet. A typical Western diet contains highly digestible starches that have a high glycemic index. Foods like potatoes, rice, pasta, cereals and breads are low in resistant starch. Cooked legumes, peas and green bananas are high in resistant starch. They also have a lower glycemic index! What are some general benefits of green bananas? What are the benefits of yellow bananas? So which is better overall? Because bananas change as they ripen, they offer different benefits at each stage. While many people will continue to eat mostly yellow bananas with brown spots because of their antioxidants, green bananas may be better option for those with diabetes. But what are the downsides of green bananas? Green bananas may taste less sweet or be more bland than yellow bananas, and their texture tends to be much firmer. For that reason, they may not be the tastiest snack raw, but there are many ways you can prepare them! Here are some ideas. Slice and mix your green bananas with yogurt and oats for breakfast! Dip your green bananas in yogurt, roll in chopped nuts and freeze them as an ice cream or popsicle alternative. Dice and toss green bananas with lemon juice, salt, sugar and onion to make a tangy banana chutney. For the dressing, combine the curds, mint leaves, salt, pepper and sugar in a bowl, mix well and keep aside. Combine the bananas, lemon juice, cucumber, salt, dill leaves, crushed peanuts and prepared dressing and toss well. Serve chilled garnished with peanuts, dill leaves and green chillies. Fill a large pot two-thirds full of water. Add a dash of salt. Bring the water to a boil over medium-high heat. Wash the outside of the banana peels with soapy water to remove pesticides. Place the whole, unpeeled green bananas into the boiling water. You can add 1 tsp of lemon juice to the water to prevent the bananas from turning brown. Allow them to boil for 20 minutes or until they are soft enough to be easily pierced with a fork. Remove the bananas from the boiling water. Use a paring knife to make a lengthwise slit into the banana peel. Remove the peel from each banana.